There are a few gods in the comics world who have crossed the threshold of recognition only within their field, and are known to what may loosely be defined as “the mainstream.” They’ve done things other than comics, gotten involved in films, married Amanda Palmer. Or they’re just damned good. This is as soft as it gets: a passage from Chris Ware’s Jimmy Corrigan. 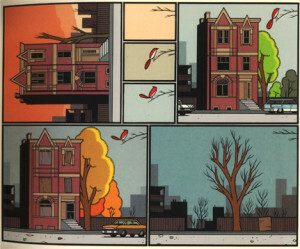 I discovered Chris Ware’s work in the early aughts, during one of my excursions to one of New York’s comics/graphic novel stores (it would have been either Midtown Comics or Forbidden Planet—I think the latter). I’m sure my brow furrowed as I paged through Ware’s Jimmy Corrigan. What was I looking at? It was immediately apparent that Ware loves to play. His books are all odd sizes and shapes, and some feature unusual bindings; his latest and most famous work takes the form of a series of booklets and pamphlets packaged in a box. The density of the drawings (and, often, the text, though it’s common to see less, rather than more, text in Ware’s work) can only be called profuse: stacked and layered together with an intricacy that hints ever so slightly at both genius and mental illness.